A template to complete in class. Based on four 3D shapes: cube/cone/cylinder/sphere. 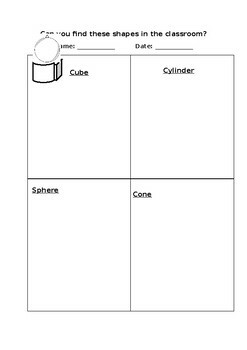 Children can draw images of the items they find in the classroom that match each of the shapes. Pictures could also be cut out from magazines, papers, catalogues, etc. and stuck into the correct area to match the shapes.